In the most recent issue of the Bulletin for the Study of Religion, Catherine Caufield (Athabasca University) offers a fascinating analysis of several modern fictional accounts of the life of Jesus. She looks at Nikos Kanzantzakis’ novel, The Last Temptation of Christ, Fyodor Dostoyevski’s, “The Grand Inquisitor” (from The Brothers Karamazov), D. H. Lawrence’s, “The Man Who Died”, and Vincent Leñero’s The Gospel of Lucas Gavilán. In exploring these fictional works through the theoretical lens of Ludwig Feuerbach and Paul Ricoeur, Caufield draws out a fascinating rhetorical motif in all of the works she studies; specifically, a disruptive narrative in which the source text (= the New Testament gospels) are somehow inverted or disrupted by the new narration from what might be expected by a modern context(s) of reception. … and thus is a type of “release” of pent up energies. The first panel illustrates the superiority (and succession!) of Christianity over Judaism. After all, Moses is really cool, but he can’t walk on water like Jesus; Jesus literally walks beyond him, offering a spatial articulation of a historical narrative in favor of Christianity over its competitor(s). While this is ideologically illustrative, it is not funny, at least not yet. 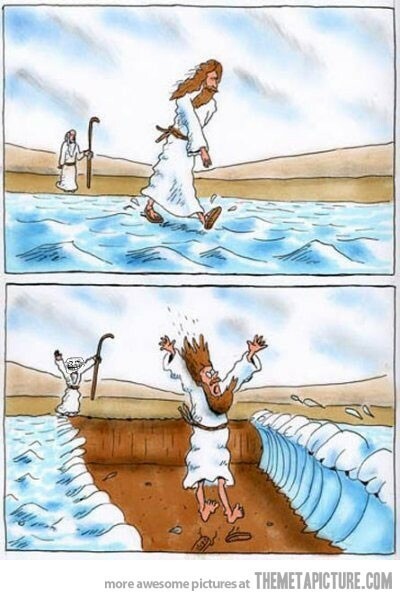 The joke is fulfilled in the second panel, where Jesus is “one up’ed” by Moses, who doesn’t need to walk on water – he just points and the water parts for him (and does this now put Jesus – and thus Christianity – in the role of Pharaoh and his army?). The narrative of the first panel has been undermined and replaced by the narrative evoked by the second panel, leaving us not only with a shift in narrative but also a good laugh. Yes, that is me holding my own t-shirt in front of class. 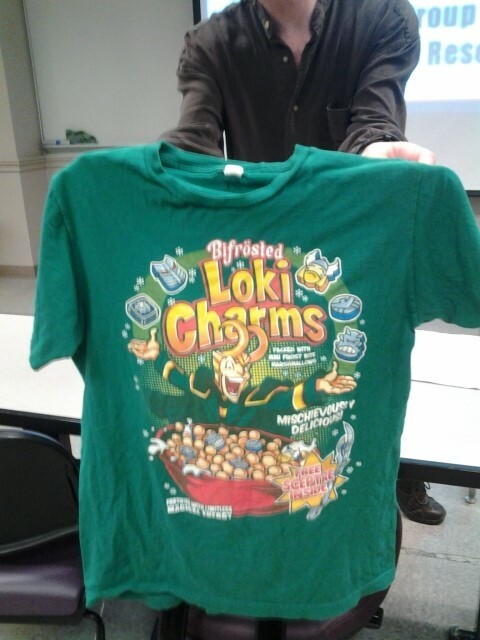 I actually own a “Loki Charms” t-shirt. The incongruity here is the weaving of two complimentary but different narratives that, thereby, stand in harmonious tension: we have a character (literally) drawn from Norse mythology (via the Marvel movie franchise for its hero Thor) and a (when I was a kid at least) popular cereal, “Lucky Charms”. The more one knows about the Thor movies and the cereal’s leprechaun character, the more amusement arises from the clashing tension of the two narratives standing beside and interwoven with each other. In these examples, the reader/viewer expects one thing, but, either due to a twist at the end or the weaving of contrasting narratives, receives a very different “ending” or presentation. The tension disrupts expected narrative meanings (given a particular or dominant interpretative history directing such expectations) and thereby facilitates the humor. 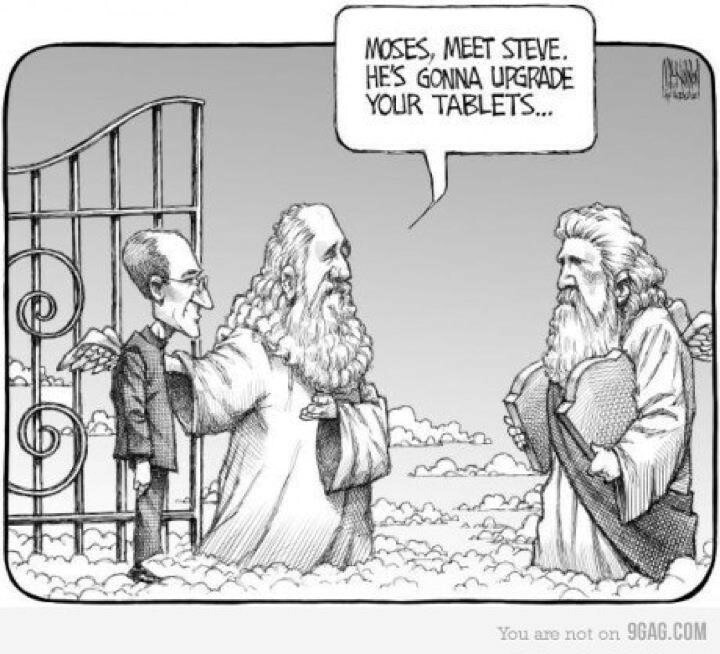 The incongruity makes the religious humor … well … humorous. 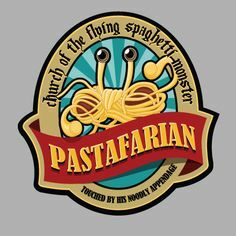 But this approach only takes us so far in studying our data – in this case religious humor in popular culture. Unless we are comfortable with just a simple phenomenological re-presentation of humor (a view that some in the discipline may wish to embrace, but, for me at least, I think is far less interesting than explanatory analysis), then I think we can ask the more analytically insightful set of questions: what does humor do? To what end do social actors create, use, counter, and claim “ownership” of religious humor? and (5) the critique of religion in the public sphere (largely through “parody religions” such as the Church of the Flying Spaghetti Monster and the Neo-American Church, where the privileged legal status of “religion” is challenged within the public sphere via parody; again, Joseph Laycock offers an excellent analysis of parody religions in his, “Laughing Matters: ‘Parody Religions’ and the Command to Compare,” Bulletin for the Study of Religion 42.3 : 19-26 ). To return to Caufield’s discussion of disruptive narrative, I think that the incongruities in much of religious humor (at least within various North American contexts) are designed to potentially provoke or “trigger” a disruption to the “received” or “normative” or “authoritative” narrative that one would expect. Such disruption not only generates possible laughter and enjoyment, at least for some in the audience, but it also allows deeper power dynamics to be played out within a range of social engagements. Note, for instance, that many of the functions I’ve listed above shift the centers of power from what might be the hegemonic or “mainstream” reading of a tradition or text to another, alternative center of authority. We are dealing with ownership of traditions here, specifically the transgression and counterclaim to ownership (and here I am appreciative to Russ McCutcheon for sensitizing me to such issues in his various works). It is in such disruption that I found much resonance with Caufield’s treatment of fictional Jesus stories among modern authors (and her examples could easily be extended to graphic novels, films, etc.). The extra-textual referent (as Caufield puts it) in such humor effectively produces “an incongruence between the world of the reader and the world of the texts [thereby] result[ing] in a surplus of meaning” (Caufield, 26-27). It is with such a surplus of meaning that religious humor – as religious humor (note the importance of the taxonomic move for social actors) – interweaves religion, politics, economics, geopolitical conflict, social stratifications, and (inter- or intra-) group relations to affect target audiences within moments of reception so as to shift power relations that seem dominant or threatened. Like any other aspect of “religion”, a study of religious humor needs to be more than just determining “what is funny” (at a descriptive, structural or substantive level) and, instead, needs to engage “to what ends and for whom is this humor constructed?” (i.e., the explanatory, dynamic and material level). 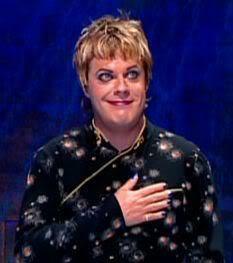 Of course, if we really want to understand and explain religious humor, we could just watch Eddie Izzard. This entry was posted in Joseph Laycock, Philip L. Tite, Politics and Religion, Reflections on Islamic Studies, Religion and Popular Culture, Religion and Society, Religion and Theory, Theory and Method, Theory in the Real World and tagged american religion, Belief, Bulletin for the Study of Religion, Catherine Caufield, Christianity, Church of the Flying Spaghetti Monster, Eddie Izzard, Herbert Spencer, humor, incongruity theory, Jesus, John Morreall, Judaism, Loki, Ludwig Feuerbach, Muhammad, narrative, Neo-American Church, Norse Myths, Parody Religons, Paul Ricoeur, relief theory, Religion, religious studies, Rhetoric, Russell McCutcheon, Sigmund Freud, Sociology of Religion, Steve Jobs, superiority theory, understanding vs. explanation, world religions. Bookmark the permalink. Thanks for the kind comments and yes of course you can share this post. I hope it helps to spark some insightful conversations on the topic. By the way, in 2013 we published an entire issue on the topic of religion and humor (Bulletin for the Study of Religion 42.3 ). It includes (after an introduction by Kelly Baker) articles by David Feltmate, Jennifer Caplan, Joseph Laycock, Jerry Jaffe, Douglas Cowan, Ken Derry, and an interview between Matt Sheedy and Dave Feltmate. Dave Feltmate also prepared a very useful “Religion and Humor: A Bibliography” for those wanting to do further research. This issue of the Bulletin might of use for you.